Characteristics: Tempered glazing (10mm thick), floor track rail guide, no aluminum framing, polycarbonate joint-covers, insulation with brushes. Basic dimensions: Upper and lower profile 50mm, upper aluminum rail driver 50x90mm, lower aluminum rail driver 43x30mm. Salinox’s FB series is a relatively different family of folding doors, especially designed for the enclosure of balconies and terraces, with their protection from challenging weather conditions in mind, while ensuring they will still be easy to use. The FB-cr moves along a small, adjustable track rail driver which can be installed on any metal or wooden surface, or concrete, making it very easy and quick to install. A specially designed rainwater drainage system is also positioned onto the flooring. 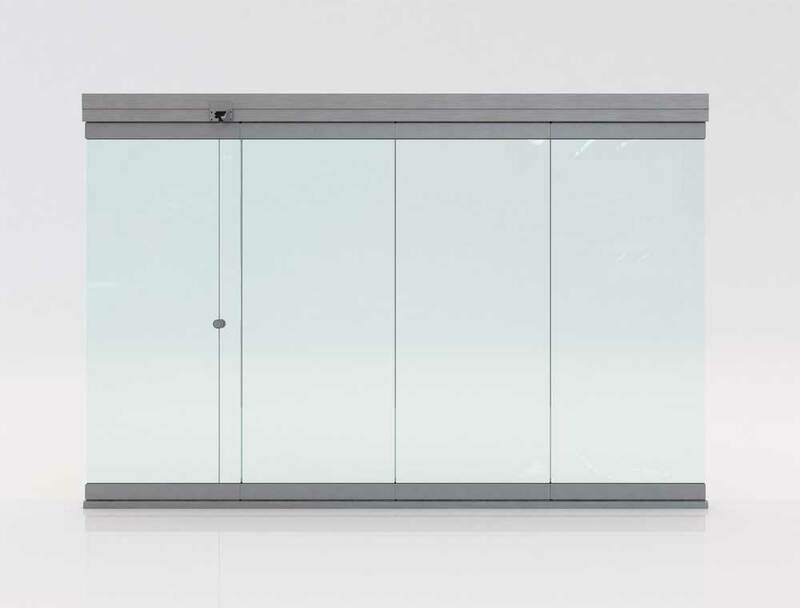 Its tempered glazing and locks guarantee the security and protection of the enclosed space, while its austere, minimalistic design offers an unobstructed view – which such spaces commonly need. Panes can move independently to one another, modifying the space according to the user’s choice, while they can be stored on the side without needing additional drivers or deflection beams, completely feeing up the opening. Water-tightness is achieved by covering gaps with polycarbonate joint-covers, while the horizontal profiles can accommodate additional insulative brushes of various sizes, to fully insulate the opening. The FB-cr panes have rollers at the top, which roll along a track rail guide of 50x90mm in size the bottom rail’s dimensions are 43x30mm. The maximum advisable pane size is 250cm in height and 60cm in width – maximum pane weight is 40kg. The FB-cr folding door system is the ideal choice for balcony coverage, as it is designed to be installed on the parapet, since it employs a bottom rail guide. They can also be used for verandas and gardens. No use of parking: In some occasions, usage of a parking area is not desirable, mainly because of aesthetic reasons. Minimalistic design: The metal parts of the system are very thin and discreet, contributing to the maximization of the glass surface.